Osage Veterans Memorial Commission members swearing-in photo, L-R, CMSGT (Ret.) Richard Perrier, Frances West-Williams, Trial Court Judge Marvin Stepson, John Henry Mashunkashey, and Alfred McKinley. The Osage Veterans Memorial Commission, formally the War Memorial Commission, was established by the Osage Nation Congress in 2011. 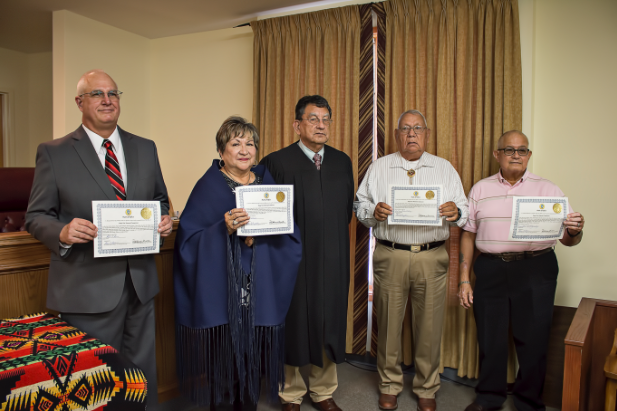 The purpose of the Commission is to follow the Osage Nation tradition of honoring Osage veterans...[and] to provide a physical reminder for present and future generations of the contributions and sacrifices of Osage veterans and their families." Frances Williams was born on December 20, 1947, in Pawhuska, Okla. She is the daughter of Juanita Ware-West and Howard M. West, Jr. Her grandparents were Susie Pryor-Craft and Howard M. West, Sr, and Lisa Clapton-Ware-Crawford and Joe Ware. She is married to John Webster Williams, Sr. They have three children; John, Stacey, and Nick Williams. She is the proud grandmother of nine grandchildren and two great-grandchildren. Williams' comes from "a long line of veterans, most of whom are combat veterans." Her paternal grandmother was a charter member of the Hominy War Mothers and her mother was a member of the Hominy War Mothers and a state officer for the Oklahoma State War Mothers. Currently, Williams serves as the president of the Hominy Chapter of American War Mothers and as the newly elected president of the Oklahoma State American War Mothers. Williams is honored to be asked to be a member of the Osage Nation Veterans Memorial Commission. Chief Master Sergeant (Ret) Richard Perrier completed his 41st year of military service in the United States Air Force (USAF) in 2017. He obtained the highest enlisted rank in 2002 and entered the top one percent of the enlisted force with his promotion to He has spent the last sixteen years as Senior Enlisted Advisor within Air Force Material Command, stationed at both Wright Patterson AFB, OH and Tinker AFB, OK. CMSgt Perrier received his Bachelor of Technology degree from Rogers State University and a Master of Science degree from Southeast Oklahoma State University. John Henry Mashunkashey is an Osage Marine Vietnam veteran born and raised in Osage County, Okla. Mashunkashey was raised in the Osage culture in the Pawhuska District. He graduated high school in 1965 from Pawhuska Public Schools. For several years, he has been working with combat veterans from WWI, WWII, Korean era and other war veterans regardless of age, race, or religion. Mashunkashey is a long time resident of Barnsdall, Okla., where he happily resides with his wife Ahnawake. The two stay busy with community and cultural events throughout Osage County and Oklahoma. Mashunkashey has two sons and six grandchildren. ONCA 11-68 - "An Act to authorize and appropriate five hundred thousand dollars ($500,000) for the Osage War memorial fund; to authorize the establishment of the Osage Nation War Memorial Commission; to establish the Osage Nation War Memorial Fund as a revolving fund; to provide selection of the site, an architectural design contest, and administration of the Osage Nation War Memorial; to establish an alternate effective date." ONCA 13-99 - "An Act to amend ONCA 11-86 to reduce the appropriation to the Osage War memorial Fund by three hundred fifty thousand dollars ($350, 000); and to establish an alternate effective date." ONCA 13-10 - "An Act to amend Chapter 4 of the Osage Nation revenue and Taxation Act of 2006 on Taxation and Registration of Motor Vehicles, 26 ONCA 4-101 et. seq. ; to define disabled veteran and Osage elder; to create additional category of passenger automobile plate fo Osage elders; and to waive, on a limited basis, the registration tax for disabled veterans and Osage elders."